Preview: Oprah Visits America’s Most Unusual Town Oprah spends the day in Fairfield, Iowa—one of the safest, greenest and most unusual communities in America. It’s the last place you’d expect to find two huge golden domes built for the thousands of residents who rush there to meditate twice a day. The full episode of Oprah’s Next Chapter aired on Sunday, March 25, at 9/8c. Welcome to TM Town Fairfield is a quiet community nestled among the cornfields of Iowa. It’s also the center of the transcendental movement in the United States. Many of the 9,000 residents who live here meditate every day, including the Winer family. Watch as the Winers reveal why they left an affluent suburb outside of Atlanta to move to Fairfield. Plus, find out how the architecture of homes in Fairfield can improve a homeowner’s happiness. The Architecture of TM Town Many homes in Fairfield, Iowa, are built in a style of architecture inspired by nature. Take a tour of one family’s home and learn about the theory behind its layout. Fairfield’s One-of-a-Kind School The Maharishi School of the Age of Enlightenment uses “consciousness-based education” to teach children from kindergarten to 12th grade everything from college prep to spiritual awakening. Watch as Oprah tours the school and shares a meditation session with some of the older students. 16 Principles of the Science of Creative Intelligence The children at the Maharishi School of the Age of Enlightenment in Fairfield, Iowa, are learning life lessons it took Oprah decades to learn. Learn the 16 principles of the Science of Creative Intelligence for yourself. Rush Hour in Fairfield, Iowa Rush hour in Fairfield, Iowa, is unlike any other town in America. 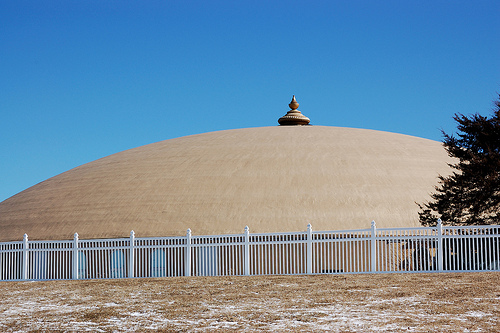 Twice a day, residents stop what they’re doing and head to two giant golden domes to meditate. Watch as Oprah meets with the town’s mayor and a founder of a nearby community to learn more about the practice of Transcendental Meditation and then tours the Bagambhrini Golden Dome of Pure Knowledge for women. Oprah Meets Iowa’s Pandits Pandits are professional meditators who practice Transcendental Meditation for hours a day in the name of world peace. For two to three years, many of these men from India devote their lives to this practice in the cornfields of Iowa. On the day Oprah visits, nearly 800 are in residence. They’ve never allowed television cameras to film them—until now. Watch as Oprah gets an unprecedented look into the life of a pandit. Three excerpts from the show are posted on The Transcendental Meditation Program website — www.tm.org/oprah — Excerpt one: Oprah’s take on TM, Excerpt Two: Why our family meditates, and Excerpt Three: From Guns to TM. The show, America’s Most Unusual Town, on Oprah’s Next Chapter, will rebroadcast Sundays, April 8 at 7:00 pm ET/6 CT and April 15, at 6 pm ET/5 pm CT. Last minute schedule changes do happen and so this info is updated. For more on Oprah’s Next Chapter visit http://www.oprah.com/OprahsNextChapter. Find OWN on TV at http://www.oprah.com/FindOWN. Here’s an article posted on the TM Blog about the preliminary results of the show: TM’s Popularity Surges After Oprah’s TV Show. The March 2012 issue of Tall Poppies, a magazine for the New Zealand Association for Gifted Children, contains an article, Teaching children to meditate, under Stress-free learning (pages 12-13). You can read the article with photos by downloading Tall Poppies: Stress Free Learning. Stephen Benner explains how meditation is helping some New Zealand children to cope better with school. Is it possible to make all kids smarter and happier than they are now? Any teacher surveying the young faces of his or her class must often wonder why is it that certain students seem to understand the lessons more quickly and easily than the rest. All the children have two eyes, two ears and one brain – yet some young brains seem to work better than others. Up until now, we have more or less accepted that the comprehension levels of a student are fixed. The accent in education has been on developing the quality of the information fed into those young brains, rather than developing the quality of the intelligence that is receiving that information. Fair enough, because up until now there has been no reliable standard technology in the world of education for ‘upgrading the hardware’ within the cranium of each and every student. However, there is now a quiet revolution going on in a number of schools around the world that is challenging the notion of fixed intelligence and the inevitability of under-achievement. This quiet revolution is being driven by the introduction of a simple, natural, mental technique utilised by all students and staff for a short period at the beginning and end of each school day. The technique is called Transcendental Meditation (TM for short), which has been available around the world in a standardised form for more than 50 years, although its origins go back to the ancient Vedic civilisation of India. Since 1970, TM has been subjected to extensive scientific research; there is now a clear understanding of its effects both during the practice and as a result of the practice. During meditation, refined levels of mental activity are experienced with the outcome being greater ‘inner wakefulness’ and enriched brain functioning. Of interest to educators is the fact that EEG studies show that whole-brain functioning is enlivened during TM practice and that different parts of the brain begin to work in a more synchronous and orderly fashion. Higher levels of brain integration are associated with greater moral reasoning, emotional stability and decreased anxiety. Simultaneously, the physiology experiences a profound level of deep rest, whereby accumulated stress and tension is naturally alleviated, leaving one refreshed, relaxed and revitalised. Over 340 peer-reviewed studies carried out at universities around the world have found a wide range of practical benefits resulting from the practice of TM, including increased creativity, focus, and memory; improved academic achievement; decreased stress, anxiety and depression; and greater happiness, coping ability and tolerance. TM comes into the daily routine of a school in the first and last 15 minutes of the day during a period called Quiet Time, when students sit in their classrooms and practise the technique along with their teacher. Taught by qualified instructors, the programme is non-sectarian and is easily integrated into any public or private school curriculum. In our experience, when the programme is fully implemented, not only do the individual teachers and students flourish, but the entire school atmosphere becomes harmonious, happy, safe and conducive to learning. As an example, when a South Auckland school decided to take on the TM Quiet Time programme a couple of years ago, the principal acknowledged that at that time the school was not a safe learning environment and was unable to provide appropriate strategies to manage the high levels of stress in the students’ lives. Lack of achievement was the norm, with only five per cent of students reaching the national standards for reading ability. Since the introduction of the TM programme, there has been a major turnaround and the school now has a calm, peaceful environment. Teachers find the students interact with each other in a more positive fashion, and 49 per cent of students are now reaching or exceeding national standards in reading. By reducing the acute stresses that undermine learning and health, and by developing the full brain, the TM Quiet Time programme is a practical, highly effective approach to promoting learning readiness among students and thereby markedly improving their academic performance and success in life. Do the claims stack up? Sceptics query whether TM really works and say its effects are not scientifically proven. However, the New York Times recently reported the results of a study focusing on transcendental meditation, concentrated on a young healthy population. The study, published in The American Journal of Hypertension, found that stressed-out college students improved their mood through TM, and those at risk for hypertension were able to reduce their blood pressure. It was carried out at American University in Washington, DC and included 298 students randomly assigned to either a meditation group or a waiting list. Students who were at risk of hypertension and practiced meditation, reduced systolic blood pressure by 6.3mm of mercury and their diastolic pressure by 4mm of mercury on average, reported the Times. Kataraina Nock, principal of Edmund Hillary School in Papakura, reflects on the changes engendered by teaching TM to her pupils. Our school motto – bestowed by Sir Edmund Hillary at the official opening in 1963 – is ‘Aim High, Be Determined’. It presents a formidable challenge to all who have participated in the transformation process of turning around a school with a long history of failure. Now, in the sixth year of change, it is a much better place. This is mainly attributable to the many people who have entered the gates with their hands up to help. They are all passionate, committed people who see a need and want to contribute. Among them is our Transcendental Meditation family, who began by training staff and later students. The Board, school, families and community have given their wholehearted support and the entire school has been practising the TM technique twice each day at school for the past two-and-a-half years. Yrs 1–5 students walk either inside or outside their classroom for five minutes with their eyes open and meditate. Students from Yrs 6–8 sit at their desks in the classroom, close their eyes and meditate for 12 minutes. What have we noticed over those two-and-a-half years? The school is now a much more peaceful place most of the time. The number of incidents involving children in conflict has significantly reduced over time and there are no longer queues waiting to see the principal. Visitors make various comments about the tone of the school. Some say there is a feeling of ‘aroha’, others remark on how happy and friendly the children are. Those who know the history, comment on the remarkable change in the school environment. Teachers report that students are more settled in class, have increased concentration and are doing their work better. This is evident in the changes in student achievement. In 2011, reading results school-wide showed some outstanding improvement. For example, in 2010, for Yr 4 Pacifika Boys, 87 per cent were below or well below the national standard, while 13 per cent were above. In 2011, for the same group, 86 per cent were reading at national standard and 14 per cent were above. As a result, by 2012 there were no children in this year group in need of additional learning support; they had moved from poor-achieving to high-achieving readers. The children themselves say they find it easier to study and they feel calmer, happier and less pressured. Another significant difference now is the stability of staffing. Up until 2010, the recruitment and retention of quality teachers was a major issue. Now, in 2012, most of the teachers have been in the school for two years or more. All staff except for a new teacher this year have trained in TM. We appreciate and value the opportunity we have been given as a result of the introduction of TM into Edmund Hillary School. We are aiming high and are determined to reach the top of the mountain, just as Sir Edmund Hillary did. Transcendental Meditation is helping us get there. Tall Poppies is a quality magazine aimed at gifted children and their families, professionals in the field of gifted education, and the general public. It is published three times a year and posted to all NZAGC members (including overseas members) as part of their subscription. Oprah spends the day in Fairfield, Iowa—one of the safest, greenest and most unusual communities in America. In the middle of corn country, it’s probably the last place you’d expect to find a dome and an evening traffic jam where thousands of the local population of 9,400 are headed to meditate. Oprah’s journey begins at a unique school where twice-daily Transcendental Meditation (TM) is a mandatory part of the curriculum. Next, she visits the neighboring community of Maharishi Vedic City—named after the Indian guru who founded the TM movement. Here, nonorganic food is banned, and all houses face east, adhering to an ancient Indian architectural style that is said to bring peace and harmony to one’s surroundings. Maharishi Vedic City is also home to a top secret, 80-acre compound where 800 men from India live and spend eight hours a day meditating, chanting and studying. Cameras have never been allowed inside their community—until now. Welcome to Fairfield! Meet a family who uprooted their entire lives to move here—and couldn’t be happier. Fairfield is a quiet community nestled among the cornfields of Iowa. It’s also the center of the transcendental movement in the United States. Many of the 9,000 residents who live here meditate every day, including the Winer family. Watch as the Winers reveal why they left an affluent suburb outside of Atlanta to move to Fairfield. Plus, find out how the architecture of homes in Fairfield can improve a homeowner’s happiness. Take a tour of Fairfield’s one-of-a-kind school. The Maharishi School of the Age of Enlightenment uses “consciousness-based education” to teach children from kindergarten to 12th grade everything from college prep to spiritual awakening. Watch as Oprah tours the school and shares a meditation session with some of the older students. Witness Fairfield’s nontraditional rush hour and learn more about what Transcendental Meditation means. Rush hour in Fairfield, Iowa, is unlike any other town in America. Twice a day, residents stop what they’re doing and head to two giant golden domes to meditate. Watch as Oprah meets with the town’s mayor and a founder of a nearby community to learn more about the practice of Transcendental Meditation and then tours the Bagambhrini Golden Dome of Pure Knowledge for women. Pandits are professional meditators who practice Transcendental Meditation for hours a day in the name of world peace. For two to three years, many of these men from India devote their lives to this practice in the cornfields of Iowa. On the day Oprah visits, nearly 800 are in residence. They’ve never allowed television cameras to film them—until now. Watch as Oprah gets an unprecedented look into the life of a pandit. For a review of the show, see this HuffPost article by Jeanne Ball: Oprah’s Next Chapter: Meditation—In ‘America’s Most Unusual Town’. Excerpts from the show will soon be available for streaming on http://www.tm.org/oprah. Please refer to the OWN TV schedule on the website to see if the show will be airing again. The schedule is subject to change so continue to check the site for updates: http://www.oprah.com/own/tv-schedule/index.html. Also check the specific show section on Oprah.com/own to view the latest videos, and the FULL EPISODE section: http://www.oprah.com/own/episodes.html. See this more recent post with all the Video segments of Oprah’s Next Chapter on OWN: Oprah Visits Fairfield, Iowa—”TM Town”—America’s Most Unusual Town. The already more-well-known-than-you-think town of Fairfield, Ia., is about to have its national visibility grow by Oprah-esque proportions. Fairfield Mayor Ed Malloy, who took the media mogul on a tour of one of the university’s golden domes before she meditated there with about 400 other women, said Winfrey already had a working knowledge of Transcendental Meditation based on her experience with inner-city school systems. Oprah spends the day in Fairfield, Iowa—one of the safest, greenest and most unusual communities in America. It’s the last place you’d expect to find two huge golden domes built for the thousands of residents who rush there to meditate twice a day. Watch a sneak preview; then tune in for the full episode of Oprah’s Next Chapter on Sunday, March 25, at 9/8c. Transcendental Meditation first came to Fairfield by way of the Maharishi Mahesh Yogi, who gained international fame as the guru to the Beatles before transforming the bankrupt Parsons College property into his namesake university in 1974. In 2001, the Maharishi’s followers incorporated their own town, called Maharishi Vedic City, about two miles north of Fairfield. Sales of non-organic food are banned and buildings are designed to follow principles the Maharishi established, such as facing east and featuring a golden roof ornament. About 1,300 people live there, and an estimated one-quarter of Fairfield’s 10,000 residents also practice Transcendental Meditation. Winfrey has tried to make a similar impact on her employees by encouraging them to meditate twice during each work day. Paul Chesnutt-Winer, who hosted Winfrey in his home and will be featured with his family on Oprah’s television show, said the practice of Transcendental Meditation could not have made a better friend. “She’s an amazing combination of being a strong, executive woman and really a lot of fun,” he said. See this earlier post by Todd Erzen on Mar 22, 2012 with links to a preview of the show and interview with Dr. Oz on Oprah’s visit to Fairfield and company-wide practice of the Transcendental Meditation technique. 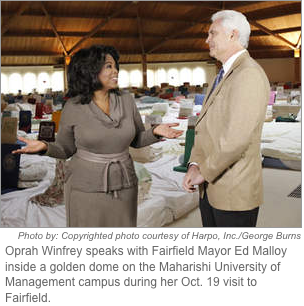 Fairfield sees itself through Oprah’s eyes on Sunday. For information on Transcendental Meditation, visit www.tm.org. Related articles: Chicago Sun-Times: Oprah will talk about transcendental meditation on OWN | The Fairfield Ledger:Fairfield readies for Sunday debut on Oprah network | OWN: Oprah Visits America’s Most Unusual Town, Sunday, March 25, 8 p.m. CT, 9-10 p.m. ET/PT | KTVO: Fairfield to be featured on Oprah Winfrey Network | Oprah writes in O Mag about her visit to TM Town and meditating with ladies in their Golden Dome | Some Reports on Dr. Oz’s Interview with Oprah about TM and her Next Chapter | Oprah meditates with ladies in MUM Golden Dome | Reports of Oprah’s visit to Fairfield, Iowa | Oprah says she and her staff meditate, enjoy a Quiet Time twice a day—Facebook Live interview. Also see The Iowan: Sizing Up Small Towns: Rethinking Success in Rural Iowa: Fairfield Thinks Inclusively. David Lynch talks about TM and his David Lynch Foundation for Consciousness-Based Education and World Peace. We know filmmaker David Lynch for the dark surrealism of “Eraserhead,” “Blue Velvet,” “Inland Empire” and “Twin Peaks,” as well as for his deep, abiding love of coffee. Lynch is also passionate about transcendental meditation, which he first took up “on a beautiful, sunny Saturday morning” in 1973. That passion spawned a book, “Catching the Big Fish,” and the David Lynch Foundation for Consciousness-Based Education and World Peace. Lynch spoke about what TM means for him and why others should try it too. Can you describe how you discovered TM? I didn’t know anything about meditation, and I thought it was a waste of time. Then I heard a phrase that true happiness is not out there, true happiness lies within. And I started thinking about that, and it had a ring of truth. It hit me that maybe meditation was the way to go within. I was filled with an anger and sorrows and doubts and melancholy. And I took it out on my first wife. I made her life pretty much a hell. So I start transcendental meditation, and two weeks later she comes to me and says, “What is going on? This anger, where did it go?” Things lift away so naturally. Your foundation started with introducing TM into schools. What changes have you seen in students who have been through the program? They say stress is hitting kids at a younger and younger age. There’s violence, bullies, there’s very little learning, and it’s not fun to learn. [With TM] they get more intelligence, they have more creativity, more energy, more happiness, and then when the teacher says something, understanding is growing. The teachers say, “Now Billy can focus, and Suzy is just blossoming.” Kids start finding what they really love and finding a way to do it. The foundation has now expanded to other realms, such as introducing TM to veterans and prisoners. Prisoners get this technique and they get super, super happy. And they get this ability to pause before they do something. So something that people say is, “Before I started meditating, I just reacted. Now, with meditation, I have this pause and this reasoning: Do I really want to blow this man’s head off with a .357 Magnum in my hand?” And then the answer is, “No, I don’t think so.” They have time to think. Is it hard to meditate in certain places? You can do it anywhere. One of my best meditations was in kind of a little closet room with a wall that was by a sidewalk. All during my meditation, there was some guy jackhammering the concrete sidewalk. But as he jackhammered, it jiggled the bliss in me and I was just flying high. It was so beautiful. Are coffee and TM compatible? For me, coffee and transcendental meditation go together like a horse and carriage. You don’t have to give up anything to do TM. I think most meditators go easy on the coffee, naturally. I smoke cigarettes too, and most meditators say the urge to smoke kind of lifted away when they started meditating. Not me! My urge to smoke got greater. I just love tobacco. I eat pretty good, but I just love these things, and that’s the way it is. 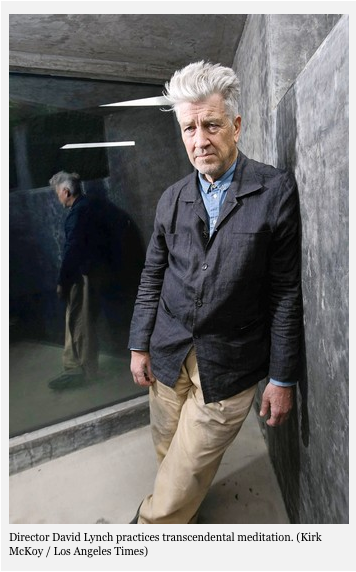 Also see HUFFPOST: David Lynch: Why I Meditate and The Wall Street Journal: 20 ODD QUESTIONS (with David Lynch).